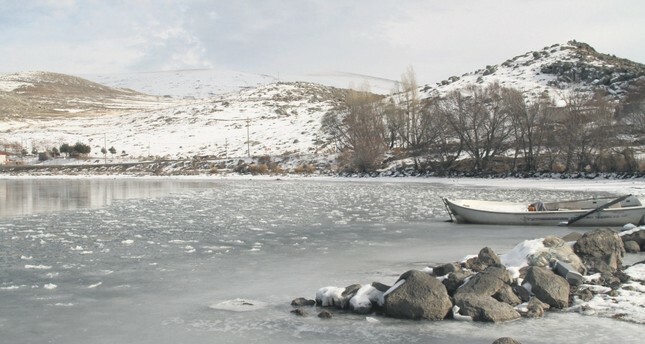 Lake Çıldır in Ardahan has begun to freeze and will stay frozen for up to eight months. Situated 1,959 meters above sea level, Lake Çıldır usually starts to freeze in the beginning of winter as the temperature drops to minus 10 degrees during the night. What makes Lake Çıldır, which covers 123,000 square meters, unique is that tourism activities and fishermen's livelihood start when the lake is frozen. Çıldır fishermen say the ice on the lake has to be 15 centimeters thick for them to begin fishing. "This year, Lake Çıldır began to freeze later than usual. By now, the lake should have been covered by ice. Once the lake is frozen, this region looks like a plain. In a week, we will start fishing like Eskimos," said one of the local fisherman. Locals as well as tourists also enjoy grilling parties on the lake. Once the lake is frozen, people grill the fish they catch and have a nice picnic out in the cold.